AgInjuryNews.org is a great resource to monitor injury and fatality trends. These are not official numbers, but are gleaned from news reports across the U.S. 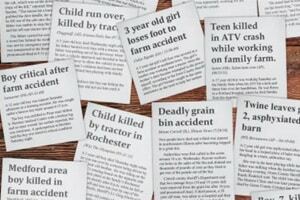 Developed by staff at the National Children’s Center for Rural and Agricultural Health and Safety (NCCRAHS) in 2015, this web-based tool compiles newspaper articles through a combination of Google alerts, review of media clippings and verified personal submissions. From their database we summarized injuries and illnesses throughout the upper Midwestern states (Iowa, Minnesota, North Dakota, South Dakota and Wisconsin). Reviewing articles within the database identified 53 agriculture work-related injuries in 2015 and 76 (as of October 1) in 2016. This included 24 fatalities in 2015 and 45 fatalities in 2016. 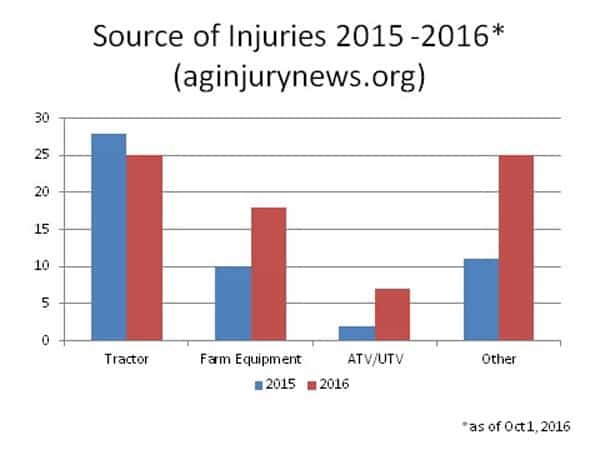 Tractors accounted for 41% of the injuries and fatalities reported during 2015 and 2016 (as of Oct 1, 2016). Other farm equipment including hay wagons, forage choppers, cherry pickers, and other machinery were also listed in the top five causes of injury for both years. Overwhelmingly, most of the people involved in these incidents were 18 years of age or older (80%) and male (93%). There were 5 children under the age of 10 recorded in the database. The table below shows a general comparison of the source of work-related injuries in the Upper Midwest from articles posted in 2015 and 2016 as of Oct 1, 2016. This is a reminder of some of the causes of injuries and fatalities for our farm workers and families. Thanks to the National Children’s Center for Rural and Agricultural Health and Safety for providing this valuable and timely resource.